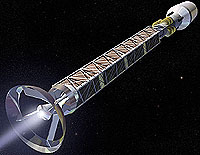 Although a robot star probe could be structurally designed to withstand very high accelerations in order quickly to reach a cruising speed that was a substantial fraction of the speed of light, the same would not be possible with manned interstellar craft. Human beings can tolerate up to 10g for a few seconds and around 3g (the peak rate of acceleration of the Space Shuttle) for longer periods, but such accelerations and decelerations would be out of the question for a journey lasting years. The optimum rate of acceleration for manned flight to the stars would be 1g, since this would allow the crew to live under normal Earth gravity conditions while still enabling the spacecraft to gain speed at a rate practicable for interstellar travel. Given such acceleration, it would be possible to reach the Orion Nebula (about 1,000 light-years away) in 30 years of shipboard time. As the 1g spacecraft drew closer and closer to the speed of light, relativistic effects such as time dilation would become increasingly apparent. Time would pass more slowly on the ship in comparison with time on Earth. For example, after a round-trip journey at 1g acceleration and deceleration lasting 10 years as measured by the crew, 24 years would have elapsed back home. Relativistic effects would also ensure that, as measured by stationary observers, a spacecraft could not continue to build speed at 1g, or 9.8 meters per second per second, indefinitely. If it did, in just under one year it would break the light-barrier. According to the special theory of relativity no object can be accelerated to the speed of light. Instead, as light-speed were approached, the relationship between space and time would alter in the spacecraft's frame of reference so that although the crew would continue to feel and register on their instruments a 1g acceleration, stationary observers would see the spacecraft simply drawing ever nearer – but never quite reaching – the ultimate speed limit of light. The table shows some of the dramatic possibilities for lengthy excursions in a 1g spacecraft. These figures assume equal periods of acceleration and deceleration at 1g on both the outgoing and return legs of the journey. See also interstellar propulsion.